LAKE LURE, NC (November 17, 2015): Watch Santa rappel down the world’s largest natural chimney, take a carriage ride through more than a million lights, stroll through quaint downtowns with painted Christmas scenes and animated windows, visit a holiday fairy garden and see the annual parades. These are just a few of the many ways to enjoy the winter holidays in Lake Lure and the Blue Ridge Foothills. Annual Christmas Lighting Ceremony: November 26, 6 p.m.
Forest City Christmas Parade: November 29, 3 p.m. – 5 p.m. Enjoy live music and view the uniquely painted shop windows throughout Main Street. Visit Santa’s House (free) to tell him what’s on your list: Fridays & Saturdays, 5 p.m. – 8:30 p.m.
Click here to download Forest City’s Hometown Holidays brochure. The annual Rutherfordton-Spindale Christmas Parade passes jolly trees and bright lights along both main streets on December 5! The parade route begins in Spindale, where you can recall classic Christmas stories from your childhood by strolling downtown Main Street and their painted window scenes before the procession begins at 3:30 p.m. The parade makes it to Rutherfordton around 5 p.m., right after the lighting of the Rutherfordton town Christmas tree! See Christmas floats, fire trucks, dance teams, marching bands and even Santa; Mrs. Claus will also be handing out cookies! While awaiting the parade on December 5, shop along Main Street Rutherfordton to see magical live Christmas windows showcasing creative holiday displays. Enjoy the magic of a fairy village at the Lake Lure Flowering Bridge. With more than 700 species of plants and flowers, the bridge is only the second of its kinds in the country. The garden beds transition into a winter wonderland featuring fairies, holiday lights and whimsical accouterments by local artists. 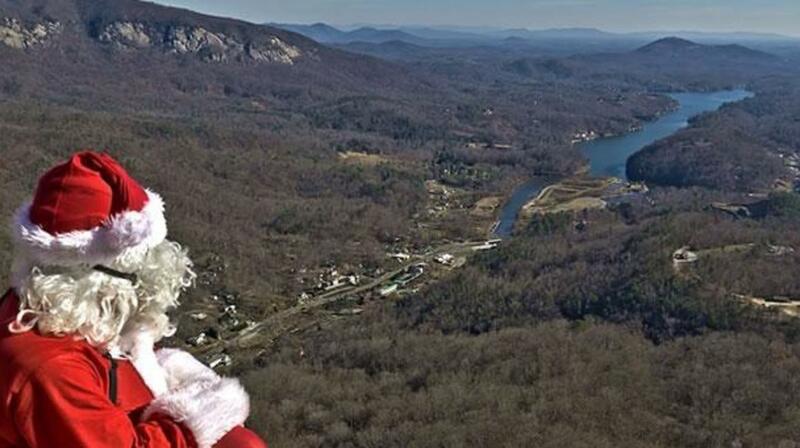 Witness Santa practicing for the world’s chimneys by rappelling down ours – Chimney Rock at Chimney Rock State Park! Enjoy this unique event (included with park admission) on December 5 and 12 with live holiday music, hot cocoa, cookies, kids’ activities and more. There’s nothing like Christmas in Chimney Rock Village! Mr. and Mrs. Claus will be there on December 5, along with carolers, to welcome you and encourage you to get a head start on that yuletide shopping! Wrap up the holiday season and kick off the New Year by taking the Lake Lure New Year’s Day Polar Plunge on the Beach at Lake Lure! On Jan. 1 register from 10:30 a.m. to 11:30 a.m. for the plunge, which takes place at noon. You’ll be “freezin’ for a reason” – the $20 registration fee (which includes a towel) goes to support local charities. There will be a bonfire, games, costume contest, cash prizes and hot chocolate!